Paulette Raymond knows how powerful words can be. Paulette is a writer—from the time she was very little, she used poetry to process any pain she experienced. So it’s no surprise that her reason for volunteering with Threads of Life is to share her story with others. On September 13, 2009, Paulette’s brother Tommy, a foreman, was killed when he was run over after he fell under a tractor trailer on the container pier where he worked. Paulette described his death as a shock, saying “my brain was trying to fix it, trying to find a way to make it so it never happened”. However, she didn’t know how to fix it or how she could help herself. Paulette, third from left, after speaking at Worksafe NB conference. 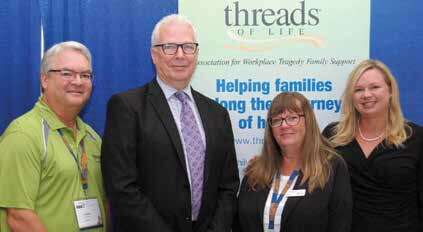 Pictured with Paulette are (left to right) Threads of Life’s Director of Partnerships and Fundraising Scott McKay; Doug Jones, WorksafeNB President and CEO; and Shelly Dauphinee, WorksafeNB Vice-President, Claims Management and Rehabilitation and member of Threads of Life’s Board of Directors. Paulette first heard of Threads of Life at a Day of Mourning ceremony. She attended the ceremony, not quite sure what it was and still trying to get back on her feet after Tommy’s death. She remembers hearing the organization’s name and thinking, “what is that?”. After some investigation, she quickly realized Threads of Life was exactly what she needed. She attended a family forum, and it wasn’t long until she started training to be a Threads of Life volunteer. Paulette realized that while she couldn’t fix what happened, the only thing she could do was try and make something good come from the pain she and her family felt. Volunteering with Threads of Life is an important part of her grief journey. Every time that she shares her story, she notices that it eases the grief a little bit. “I wasn’t consumed in pain all the time,” she says. Every time she speaks about the importance of workplace safety, she gets a little bit stronger. 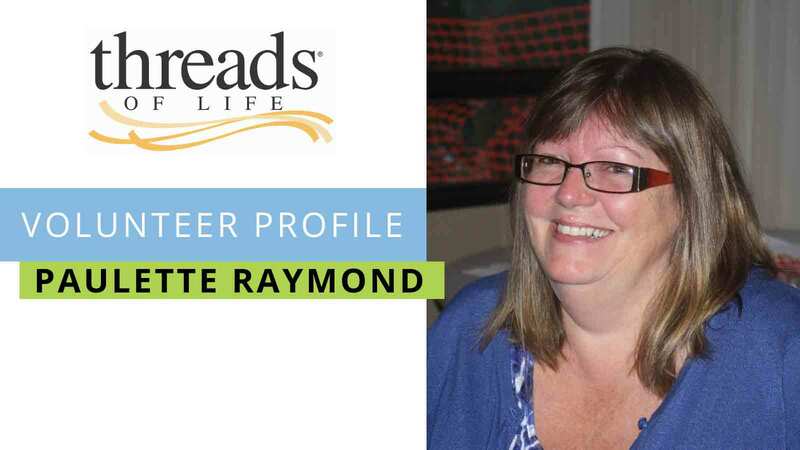 Paulette is now a Threads of Life volunteer family guide and a member of the Speakers Bureau, but always looks to find any opportunity or training that will allow her to speak about workplace safety. Her heart lies in sharing her message of prevention. When Paulette speaks in workplaces, she can see the power of sharing her story. She says she hopes her presentation reaches even a handful of people each time and changes the way they think about workplace safety and the safety of their employees or coworkers. For Paulette, the reason to go out and tell her story is to share the importance of split second decisions and working safely. While each and every speaking event she does is a chance to impact lives and encourage safe work, one workplace stands out as a powerful memory for Paulette. It was one of the first speaking events she had ever done as a Threads of Life volunteer. Looking out into the room, she shared that it was “wall to wall, big burly construction guys”. She remembers thinking, “how on earth are you ever going to reach them? Are they really ever going to understand the impact of this?”. She started speaking, and as she moved through her presentation, she looked up to see tears running down the faces of the workers listening to her. At the end of her presentation, the workers all stood up, took off their hats and put their hands over their hearts. They told Paulette that they would always remember her presentation—and what happened to her brother. “I understood at that moment the importance of words words that you can change the way people think. That’s certainly a memory I’ll never forget”, Paulette says. Emma Morris is the content specialist at Threads of Life. She is a digital storyteller, non-profit communicator, and self-care researcher.